I want to give a quick thanks to two amazing blogs that mentioned TaylorTailor in the last few weeks. Derek from Put This On got in touch to do a piece about learning to make your own clothes. If you are interested, there is a two part interview he did with Arno and me. You can check out part 1 here, and part 2 here. For what I think is the second year in a row (I might be wrong about that) Madalynne has asked her readers to vote on the “best sewing blogs” in 22 categories. TaylorTailor was voted as one of the best guy sewing blogs! I’m not sure if I deserve that recognition, but I was thrilled to be mentioned amongst some truly incredible and inspirational bloggers this year. You can see the full list here. Madalynne focuses on sewing, tutorials, design, and pattern making. She is also a talented photographer. I’m sure most people who read TaylorTailor are well aware of Madalynne, but if not, I would recommend checking her site out. Progress on my jacket project is slow but steady. I finally have all of the pieces drafted. 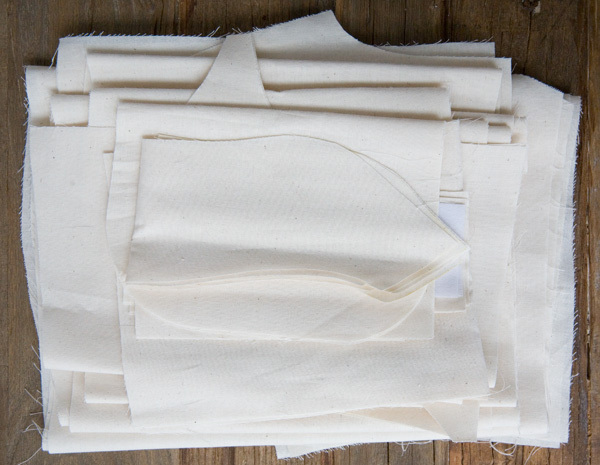 When you take all of the pockets into account, there are a gazillion little pattern pieces for different sized welts, pocket linings, and bits of interfacing for reinforcement. 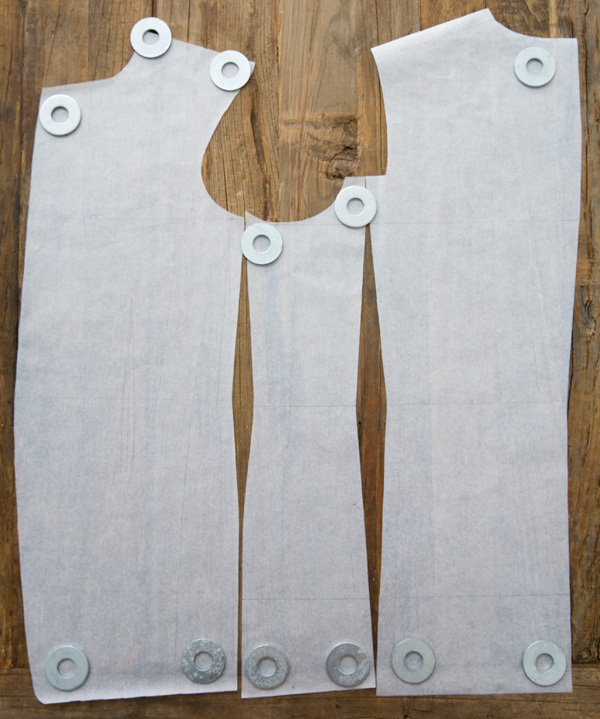 Plus, the lining basically needs a separate pattern to allow for ease and attachment seam allowance. My procedure so far has been to draft a pattern using the method I talked about here. 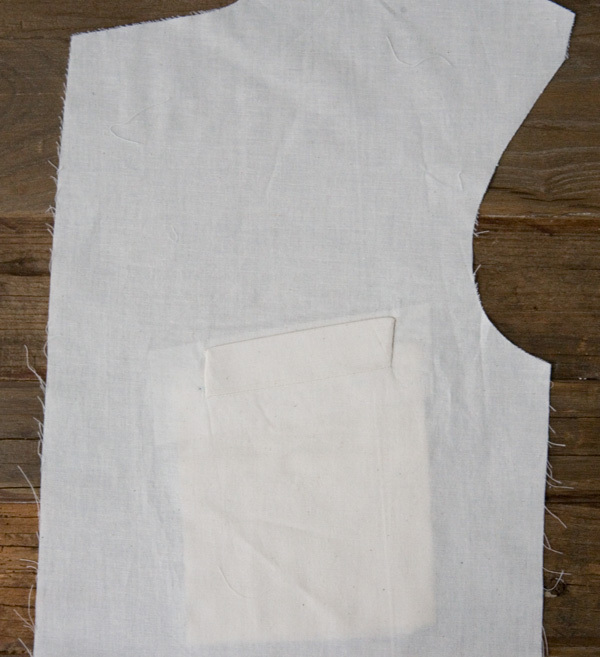 Once I had the front, back, side panel, and two piece sleeve finished, I made a muslin shell without any pockets or details (shown above) to see if the pattern was even close to fitting. The fit was far from perfect, but it was a good place to start. I tend to mark all over my muslins in pen, which makes transferring the adjustments to my paper pattern much easier. While I want a high arm hole, the initial pattern had the arm hole placed too high. The shoulder point also needed to be moved, and the upper arm area needed some additional ease. I adjusted my pattern accordingly and started a second muslin. This time around I cut out the entire jacket, lining, and all of the pockets to do a proper test fit and make sure all of the pocket pieces work together. I also want to do a practice run through the lining construction, as this will be my first time dealing with a lining (in clothing at least). There are lots of firsts for me with this project. 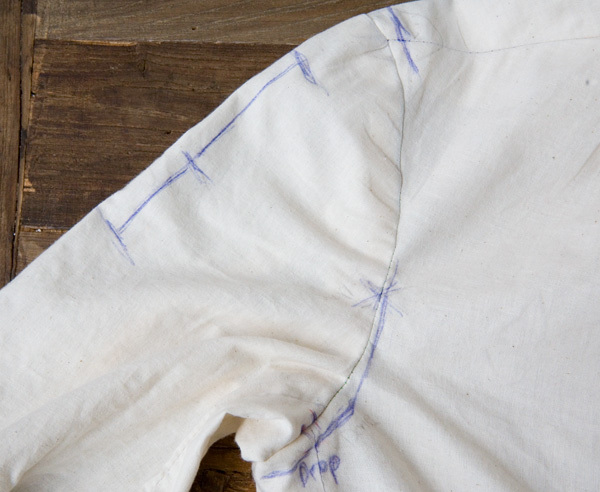 The single welt chest pocket is something I’ve never made until this muslin. 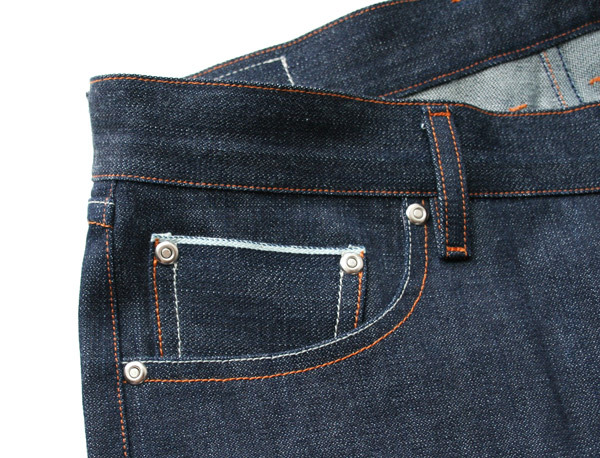 It will take some practice to get the corners and edges straight and crisp, but overall, this type of pocket didn’t seam that much more difficult than the welt pockets I’ve made for chinos. I love that this project is really challenging me to learn new techniques and construction methods. This is by far the most complicated garment I’ve ever made. Have you ever convinced yourself that something you made is great, when in reality the final product has so many flaws that you never wear or use it? After spending countless hours on a project, and who knows how much money on fabric and notions, sometimes I have trouble admitting that my amazing new piece of clothing…well, isn’t so amazing after all. That’s the case with this pair of jeans that I made a couple of years ago. After only wearing them two or three times, I finally pulled them out of the closet and decided that I either need to fix the mistakes or use the material for scraps. 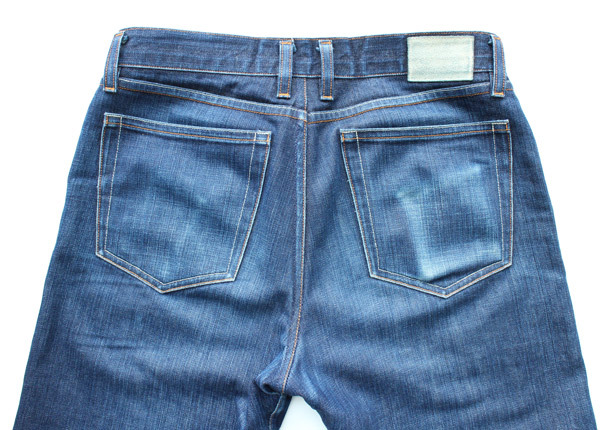 The original waistband (not pictured above) had lots of top-stitching mistakes as well as some unsightly areas where the ends of the waistband meet the fly at center front. 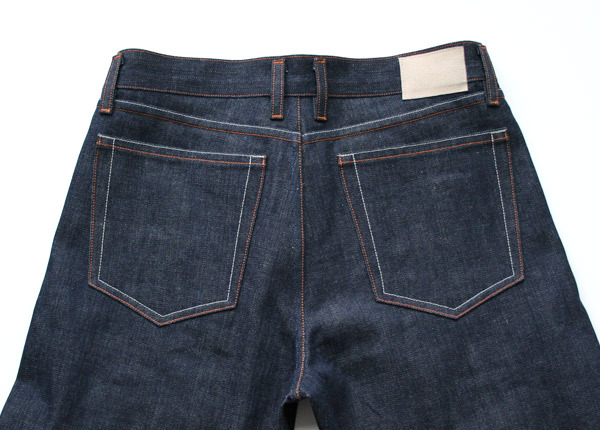 Minor issues in terms of functionality perhaps, but the flaws bugged me enough that I hesitated to wear the jeans. As I type this, I’m starting to wonder if the flaws were what bugged me, or if the fact that I was too lazy to fix them the first time around was what really bothered me. In other words, I failed to meet my own expectations. So, I got my seam ripper out and took the old waistband and belt loops off. From here I cut a new waistband, belt loops, and leather patch, and put everything back together. Other than a little bit of extra bulk where the button hole and button are placed, this time around I can truly say I’m happy with the results. In addition to the waistband problems, I disliked the way these jeans fit through the leg. This denim is really stiff. 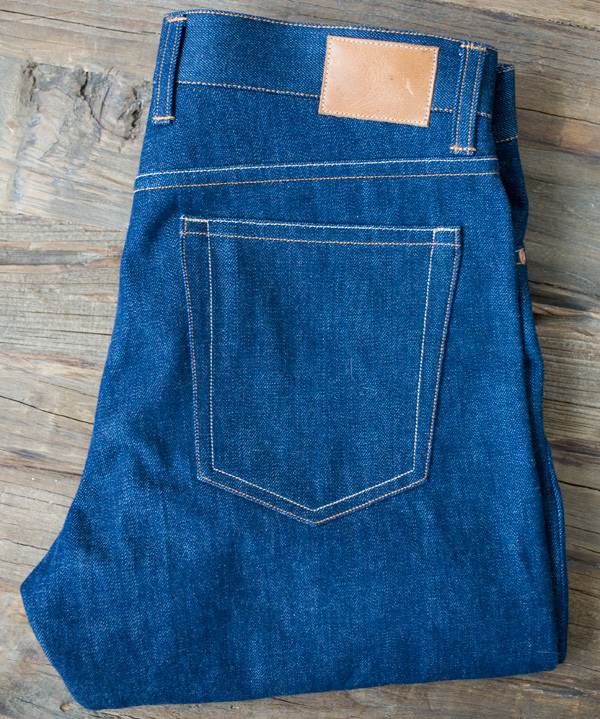 It’s a 13.5 oz rigid selvedge denim from Cone Mills. One of the things I’ve learned from working with this denim is that once it breaks in, it stretches out a little and gets really soft. 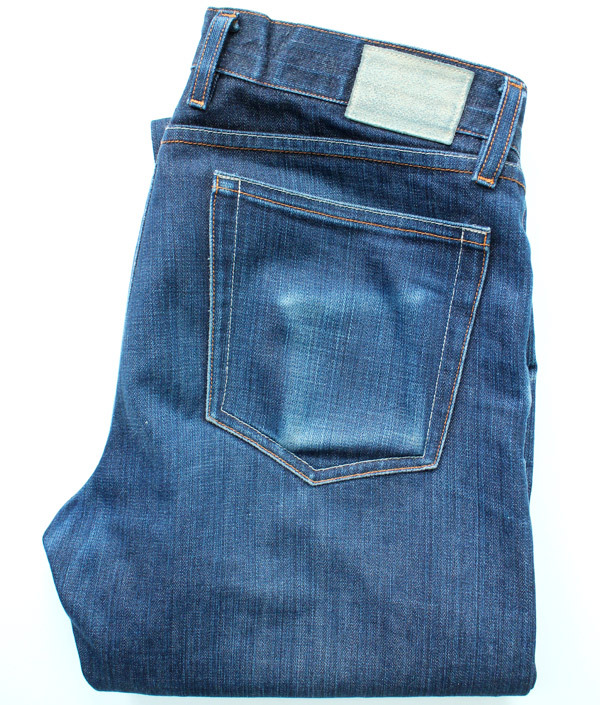 As a result, too much ease through the leg makes for slightly baggy looking jeans once the denim softens. I got my seam ripper out again, opened the hem, carefully cut through three rows of stitching that held the flat-felled inseam together, and then cut open the side seams. I slimmed the leg slightly on the inseam to remove some of the excess ease, and then put the legs back together. 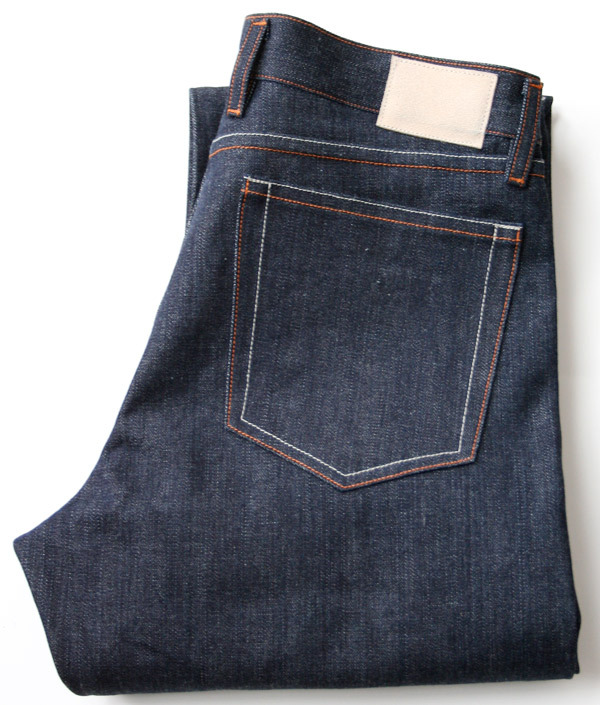 Because I used selvedge denim and wanted to preserve the clean edge of the fabric, all of the leg shape had to be on the inseam to keep the side seams perfectly straight. 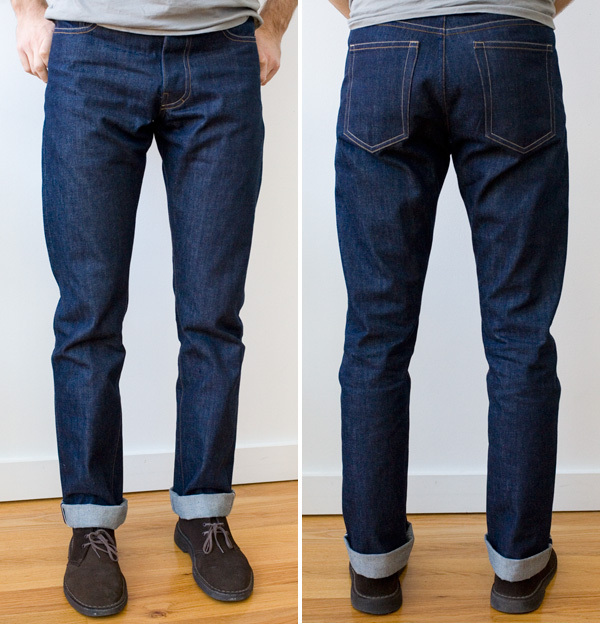 I know selvedge denim has been the rage for a while now, and I’m completely guilty of jumping on that bandwagon, but from a pattern drafting perspective, a straight side seam really isn’t the most flattering fit for some body types, including my own. Very few people’s legs are completely straight, so cutting pants with a straight side seam creates a leg that seems unbalanced. These are men’s jeans, not tailored suit trousers, so I’m not too worried about it, but I definitely notice this more when the denim is new and stiff. That brings me to my roll top backpack pattern delay. I want to make sure this first pattern lives up to my own standards, and while I anticipated having it completed and released by now, I am going to take some more time to get the directions right, printing format right, and make sure all of the details are in order. There are so many details, things I never considered when drafting patterns for myself. My take-away from both of these processes (fixing jeans and releasing my first pattern) is to not settle for anything other than my absolute best work. Especially in the case of my backpack pattern. If people are going to be spending their hard earned money on it, I want the final product to be worthwhile. I’m so excited to share this “sketch” of my first pattern that I plan to release later this fall! There might be a few slight changes from what is pictured as I am still testing and tweaking the design. I took what I learned from my first three backpacks (waxed canvas, rolltop v.1, rolltop v.2) and tried to incorporate the best elements of each into this pattern. There is lots of debate elsewhere online about pdf vs. traditional print patterns, but I’m curious to hear from anyone who might be interested in this pattern if they have a preference. There are pros and cons to both. While there is the immediate satisfaction and instant delivery from a pdf download, they can be a pain to print and assemble at home. On the flip side though, the cost to print and package physical copies of the pattern can be high, which makes the price of the pattern more expensive for y’all. I also worry a little bit about pdf copies of the pattern being so easy to distribute online. Not that any of you would give the pattern away of course :), but once a pdf hits the internet, there really is no way to stop people from giving it away for free. I would love your thoughts on this issue as well. With the exception of all-purpose thread, I plan to stock all of the supplies you would need to actually make the backpack. Initially I will offer a simple canvas fabric option, as well as all of the hardware, zippers, and webbing necessary to make the pack. Obviously people can source their own supplies, but I thought I would offer the basics through my shop. Does this sound like something in which you would be interested? As soon as the pattern is released (I don’t have an official date yet) I will be doing a comprehensive, multi-step sew-along for the backpack. 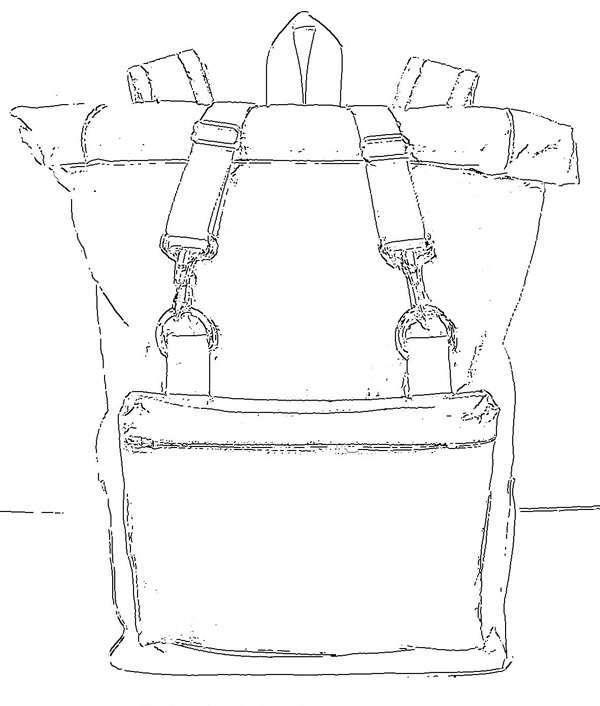 If this release goes well, my goal over time is to develop a whole line of bag and pack patterns, from zipper top backpacks, to messenger style bags, as well as duffel and smaller toiletry bags. Your thoughts on the above would be greatly appreciated. Thanks! Three years ago I started drafting a jacket pattern and got distracted. At the time, I needed shirts and pants more than a jacket so I put the project on hold. 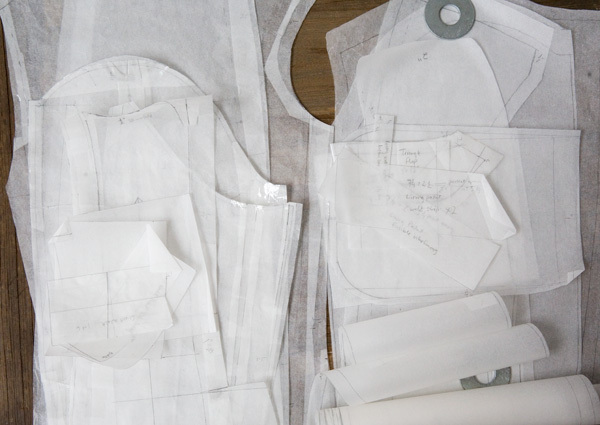 Rather than revive that old project, I decided to start completely from scratch and use a drafting system to create a new jacket, or “lounge coat” pattern. There are several drafting systems available at the Cutter and Tailor forum. On a side note, I have to give a huge thanks to all who make that forum possible. It has been amazingly helpful for this project, and I am indebted to all of the members who help to maintain the forum as a valuable resource. The drafting system I chose to work with is called Rundschau, and it is based off of four basic measurements, chest, waist, seat girth, and body height. These four measurements are then plugged into a bunch of calculations, and this set of measurements and calculated numbers form the basis of the pattern draft. As Jeffery mentions on his blog, there is some debate as to whether this is a good way to draft or not, but I was so fascinated that such systems exist, I had to try one to see how it works. Somehow the system is based off of various body proportions, which is why the entire draft can be created from four measurements. It sort of seems like magic, and to be perfectly honest, I’m not sure how this is going to turn out since I haven’t tested the fit in fabric yet. The keys to being able to complete the draft are a good tailor’s square and a lot of patience. In some ways a fearless approach is necessary to learn things like this. After reading through the forums a bit, I got some blank paper out and decided to give it a try. It might not fit, and might not be the way a professional tailor would do things, but for me this is a starting point towards creating my first jacket. Part of the reason that I haven’t kept the blog updated this summer is that I’m currently developing my first backpack pattern that I hope to offer for sale later this fall. I’m so excited I can barely stand it! There is still lots of work to do, and obviously I will be talking more about the pattern in the future. Stay tuned for more details. After experimenting with backpacks last summer (Roll top 1, Roll top 2), I got hooked on bag design. My roll top packs have been good travel companions, but occasionally there are times when I need something a little smaller with easy access zipper pockets. 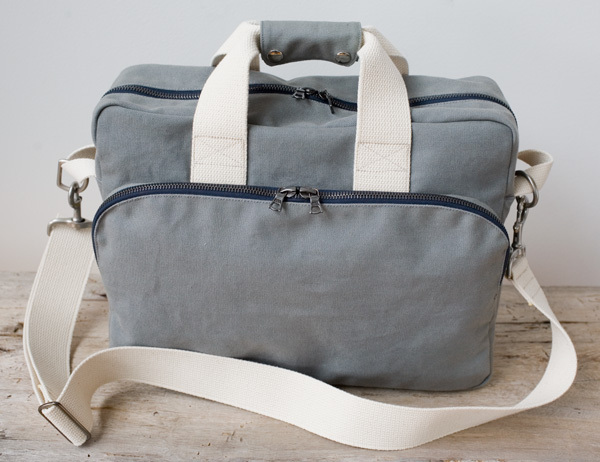 Filson makes some of the best shoulder bags on the planet, and naturally I looked to them for inspiration. 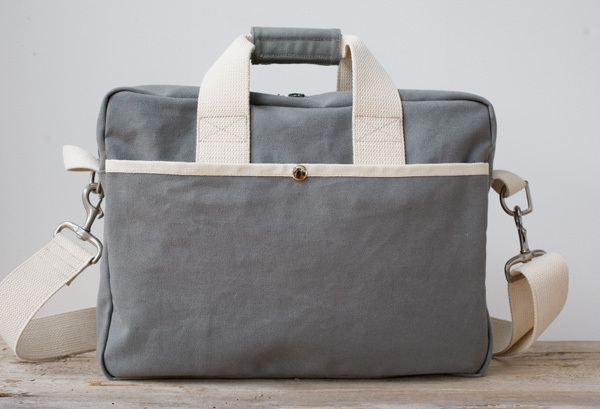 If I didn’t enjoy making my own gear, I would be saving my money for a Filson briefcase style bag instead. 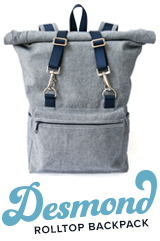 I used 18oz canvas, heavy duty Riri zippers, cotton webbing and seam tape throughout. 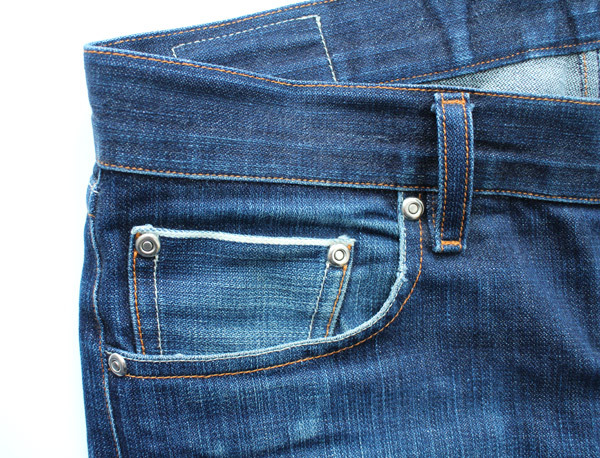 The front exterior pocket has places for pens, keys, and other small items. 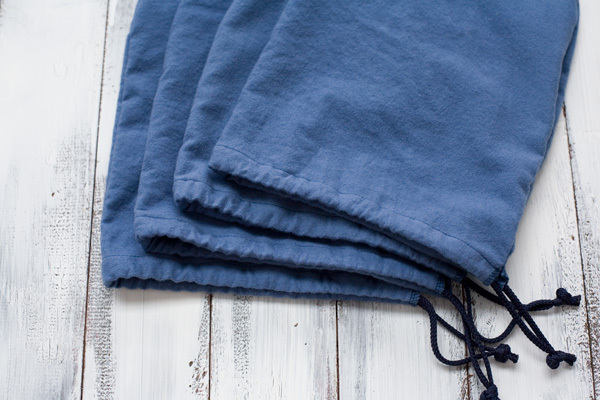 Within the main compartment is a sleeve for an iPad, phone pocket, and two slightly deeper billow style pockets for larger objects. On the backside is a flat, snap closure pocket for a newspaper, magazine, boarding pass, etc. 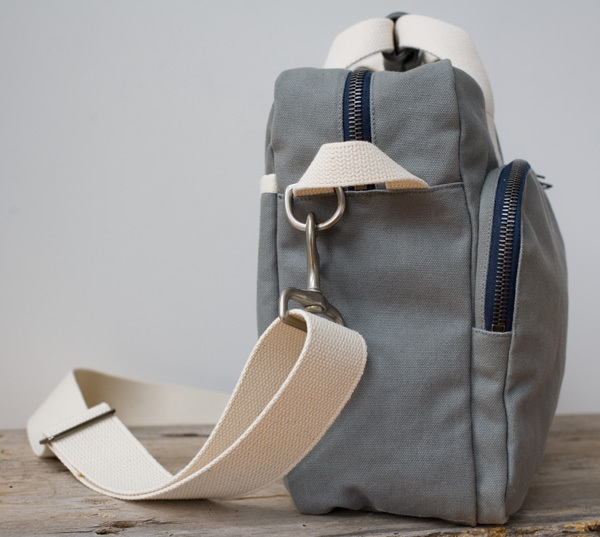 The shoulder strap is adjustable and removable if I want to carry it more like a briefcase. The bottoms of bags and packs usually show signs of wear first, so I decided to brush the bottom panel (not shown) with a thick layer of latex for durability. Anyone who follows me on Instagram has seen pictures of this project in progress. 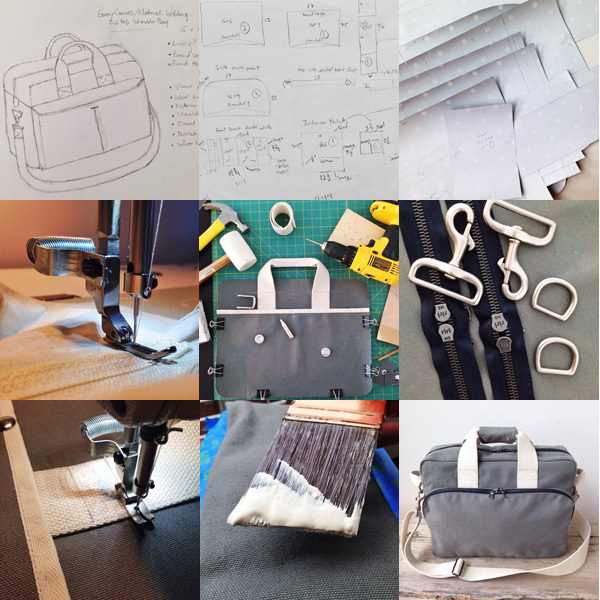 Here is a little collage of iPhone photos that start with the initial drawing, move to the pattern making process, then pattern testing and construction, and lastly the final bag. From here I think I am moving on from bags and packs for a little while and back to clothing. I know I’ve talked about making a men’s jacket/blazer several times, and even started work on it a long time ago. It’s time to actually do it. So, that’s my plan. 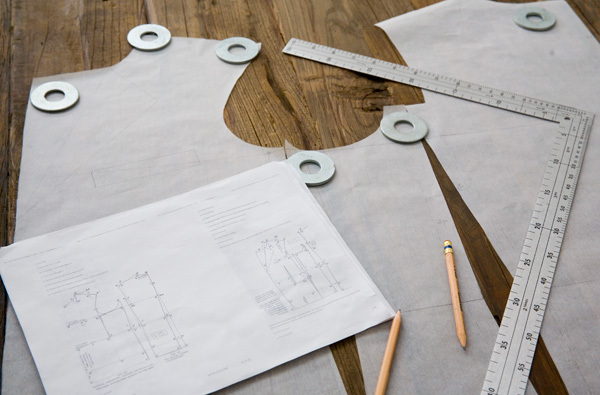 I’m currently looking for a jacket drafting system that I can use to create the pattern. Once I find one, it will probably take me most of the summer (and beyond) to get the fit right and properly learn how to put a jacket together. There are numerous online sources that I turn to on a regular basis for insight into fit and style, menswear news, and inspiration for future projects. I thought I would share some of them here for anyone who might be interested in this sort of thing. I’m not getting paid to list these websites. I simply enjoy what they have to offer and thought that some of you might as well. None of them are directly related to sewing, pattern drafting, or craft in general, and most are geared towards men. Although, if you are a lady who wants your guy to dress better, perhaps you might find something worthwhile. Put This On – “A Web Series About Dressing Like a Grownup.” I am a long time fan of PTO and think this is a great place to start for any guy who is looking to, well…dress like a grown up. Valet – “Consider us your concierge to a well-styled life.” An online men’s magazine of sorts. This Fits – “A resource for men about dressing well.” Great information on fit, style, and various menswear sales. Kempt – “World of men’s style, fashion, grooming.” Another online magazine/blog covering numerous topics. I also have to mention Alton Brown, who I have been following for years. He is famous for his role in the food world with numerous shows on the Food Network, books, tours, etc. Alton has a relatively new podcast, and while the focus is on food, he has a lot of interesting guests and covers a wide range of topics that so far have included art, guitars, life on the road, and most relevant here, his interest in men’s style/fashion. For those who are more interested in menswear, check out the episode that Alton did with Sid Mashburn where they talk about full canvas vs. fused jackets, the merits of the Navy blazer, importance of fit, and searching for that perfect vintage Rolex. Where do you draw inspiration for your projects and blogs in general? So, I made some shoe bags. I want to protect my nice shoes from dust and cat hair when I’m not wearing them. I also want to protect clean clothes from dirty shoe soles when packing my shoes in a suitcase. Shouldn’t nice shoes come with shoe bags from the manufacturer? Some companies include them, some don’t. Plus, sometimes I buy used shoes, and used shoes don’t always come with bags. When they are taken care of properly and in good condition, I don’t think so. I would rather have a really nice pair of used shoes than a crummy pair of new shoes for the same money. Full-grain leather shoes with the type of construction that allows for soles to be replaced can be expensive, and shoes don’t grow on trees. Really nice shoes can be found at a fraction of the full retail price at thrift stores and eBay. Do some research, figure out your size, and be ready when a good deal comes along. If they don’t grow on trees, where do shoes come from? Many shoes “grow” on cows, and the animal lover in me isn’t quite sure what to think about this. I know, humans have been wearing animal skin for eons, and at certain points in human history, our lives probably depended on using animal skin for protection. But, we live in a modern world with alternatives and synthetic leather, wouldn’t those be better than using real leather? Synthetic materials seem (I don’t know for certain) as if they would be bad for the environment to produce (I do recognize that large scale livestock production probably isn’t so good for the environment either). But, synthetic materials don’t break in or wear like nice leather. Leather may crease, but synthetics crack, and peel, and look awful…meh….first world problems…but at least we wouldn’t be killing animals for their skin. Like I said, I’m not sure what to think about this. I guess if we are killing the cows for food, we might as well use the hides for shoes…? Isn’t this a blog about sewing menswear, why so much shoe talk? Because I like shoes. And if I’m spending all this time making clothes for myself, my shoe game had better be decent. Part of dressing like a grown up is wearing grown up shoes. Why don’t you make shoes too? Because my wife won’t let me. The machines are too big and expensive. The learning curve would be huge, and I don’t have time. 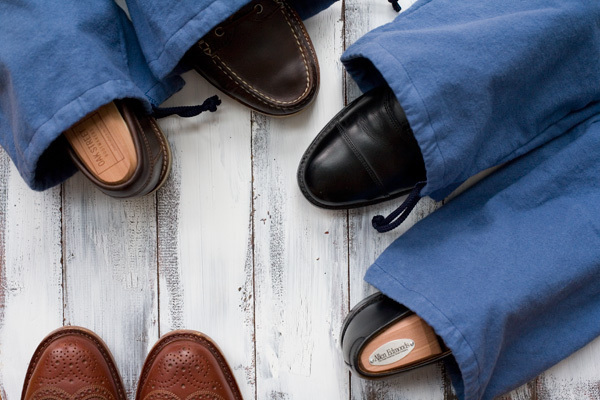 If you buy decent quality shoes to begin with and take good care of them, they will last a long time. You will probably save money in the long run. 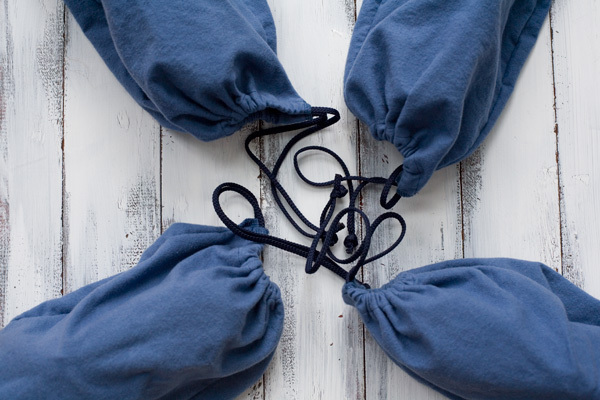 Put them in shoe bags and use shoe trees when you aren’t wearing them. Also, give your shoes a proper cleaning/conditioning when they need it. Nobody likes stinky feet or stinky shoes. Since this is a project about creating a wardrobe, I thought I would do a quick overview of where I am at as far as shirts go. I finally have a small collection of everyday casual shirts. The aqua/green-ish chambray in front, and the narrow blue and white striped shirt behind it are the two newest additions. I started work on them a month or two ago. 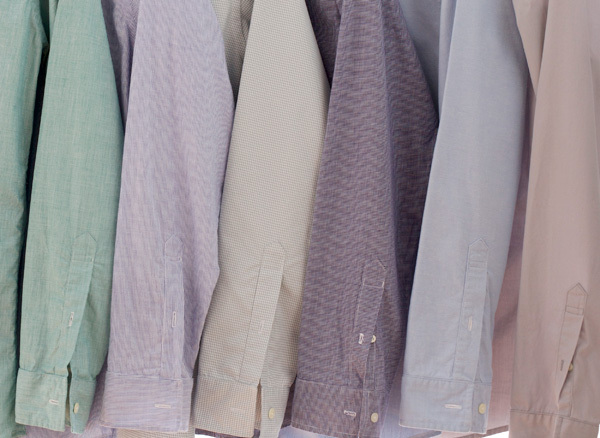 I consider all of these shirts to be casual. The collars are on the short side, making them a little awkward to wear with a tie, and the button down collars aren’t something I would wear in a formal setting anyway. 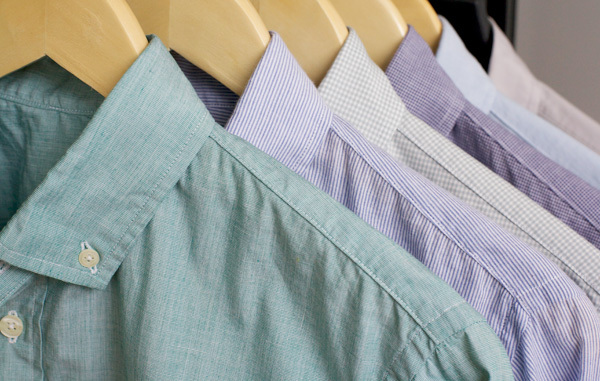 Plus, the fabrics themselves aren’t exactly the refined type from which proper dress shirts are made. That being said, these are exactly the type of shirts I use most often, and have very few occasions to wear something more formal. 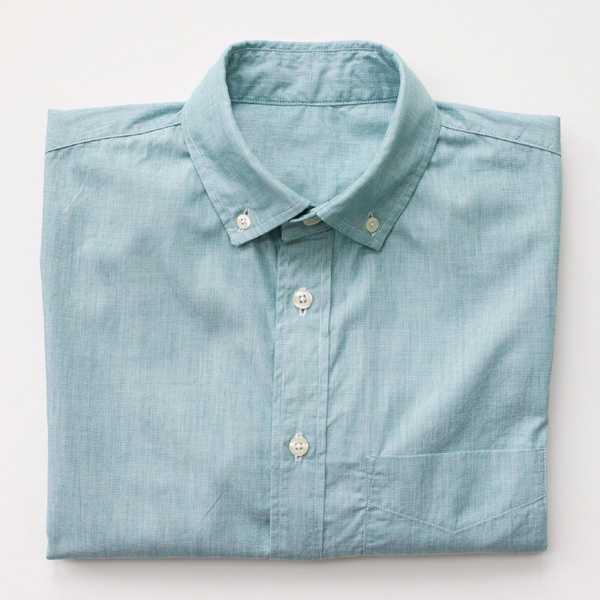 I work from home, so I do not need dressier shirts for business, and hardly ever need to wear a suit. As a result, I’ve focused my efforts so far on everyday basic shirts that work with denim as well as a variety of chinos. This doesn’t mean that I don’t like more formal clothing. In fact, there are times when I wish I had a collection of suits and ties hanging in my closet, but simply don’t have the need at this point. Since my sewing time is limited, I try to spend my time making things that are useful and that fit within the context of my everyday life. So…what to make next is the question. I may take a break from shirts for a while. 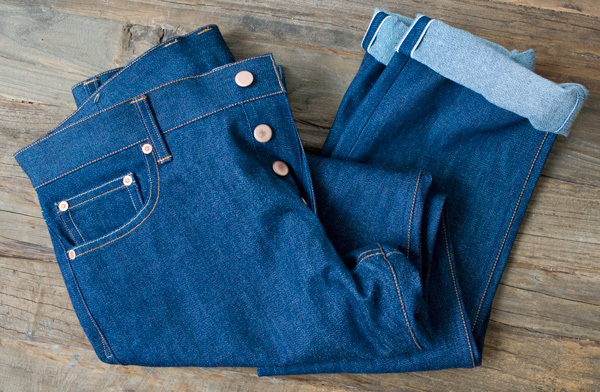 I’m good on the denim front, but would like to make one more pair of chinos in a dark gray. The other option is to dive straight into jacket/blazer making. I made an attempt at a pattern a while back and may revisit that project next. This is the exact same pair of jeans. I made these three years ago this January. While I don’t wear them everyday, and almost never wear them during the warmer months in Tennessee (June – October), these are my main go-to pair of jeans. 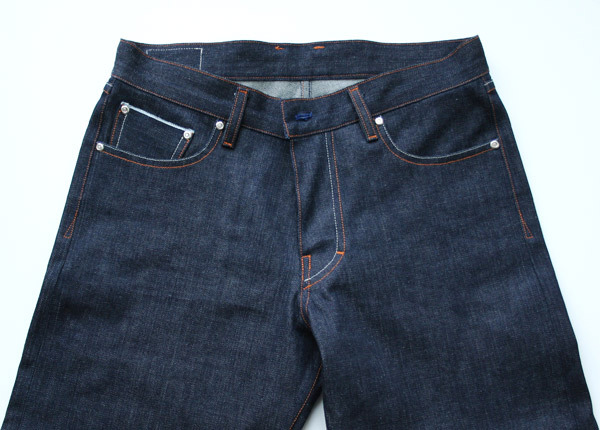 The denim, which is a 12.5 oz, 100% cotton, blue line selvedge denim from Cone Mills, was very stiff and unforgiving to begin with, but once it broke in, transformed into an amazingly soft and comfortable fabric. I love seeing the progression from “clean slate” unwashed raw denim to something more personal that reflects a little bit about who I am. 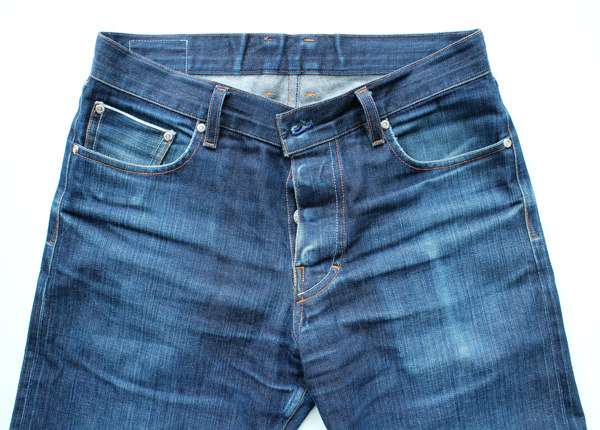 Denim and other indigo dyed fabrics are special in this regard. When cared for properly, they take on a life of their own and become more beautiful over time. One of my goals with learning how to make clothing is to try and create garments that last. 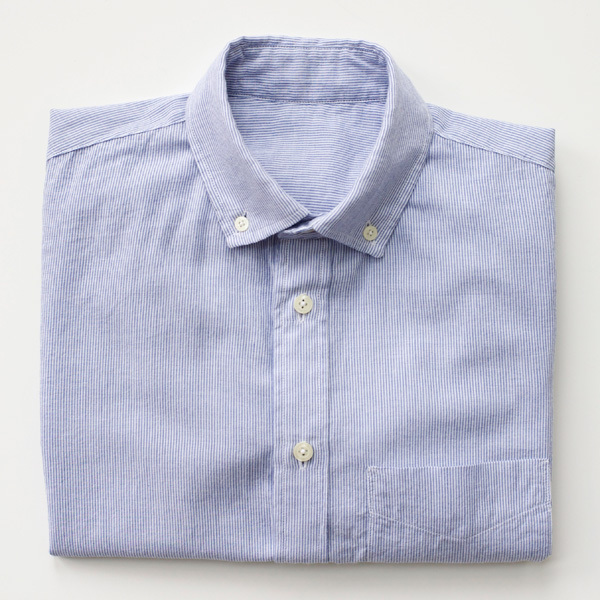 I am much more interested in “timeless” (at least in my lifetime) menswear basics than I am fashion trends. 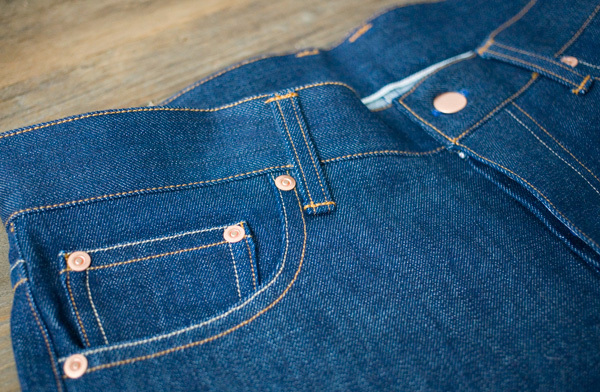 While some may argue that raw denim has been in the spotlight for the last decade or so, I’d point out that this denim was woven on antique looms that date back to the 1940’s, in a plant that started operations in 1905 in North Carolina, long before the current trend started. For me, the focus is on a quality American made fabric in its purist form, and a garment made in a way that stands up to the test of time, rather than any trend or particular movement (i.e. heritage) in the fashion industry. So far I haven’t had to make any repairs, but may need to reinforce the edge of the front pockets where contact with my wedding ring and keys are starting to fray the pocket lining. Hopefully these have a few more years of service in them. Here is to a new year, and to making things with a purpose.